Every now and then - usually around a holiday - I take a look back and share some photos of my hand stitched needlework pieces that make up my holiday decor. In 2009, I shared a piece called Rejoice, He is Risen from 1996. 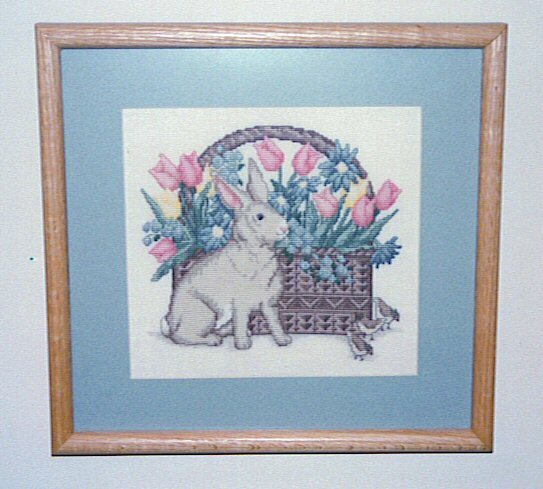 Here's a look at some of the other Easter counted cross stitch pieces in my collection. 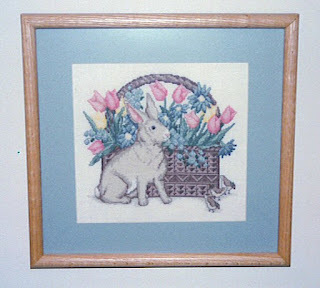 I can hardly believe that I stitched this piece, called Garden Basket, nearly 20 years ago! It was designed by Anne Fetzer, and appeared in For the Love of Cross Stitch magazine, March 1991. It's still one of my favorites! This was stitched using cotton floss on linen over two threads, and was one of the first linen pieces I ever finished and had professionally framed. 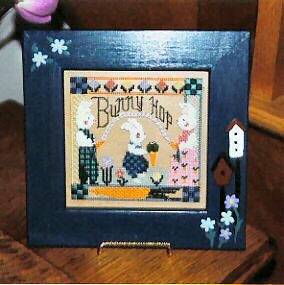 This one is called Bunny Hop, and is a Mill Hill Spring Series V kit, using seed beads and cross stitch on perforated paper. I hand-painted a wood frame from the local craft store to imitate the kit's model photo. This was completed a little more recently (only 11 years ago) in 2000. Here is Paddy O'Hare, a stand-up figure made from a Special Edition kit from Lizzie Kate. He's stitched in regular and overdyed cotton flosses on overdyed linen and is embellished with buttons, a straw hat, whiskers and a little metal shovel.I completed this one in 2003. Hello and Happy Easter to you too! I just found your blog while I was looking for an Easter photo for mine. The He Is Risen piece that you stitched is so beautiful! I hope you don't mind that I'm sharing it? I like to sew too, but lately it's been trying to make dollhouse doll clothes without much success! Hi Kathi - thank you! The 'He is Risen' piece is another one of my favorites. Thanks for linking back!